Hello, Victoria Bogner with McDaniel Knutson Financial Partners here. I wanted to take a few moments to show you some of the stuff that I look at in the stock market. So when I'm sending you those commentaries that say don't freak out and panic when the market is falling. These are just a few of the things that I look at to keep a level head myself and to come to those conclusions. So obviously I don't have a crystal ball. I don't, in fact, know exactly what's going to happen in the stock market, but we have a lot of information, and we can make some educational best guesses. So, without further ado let's get into it. 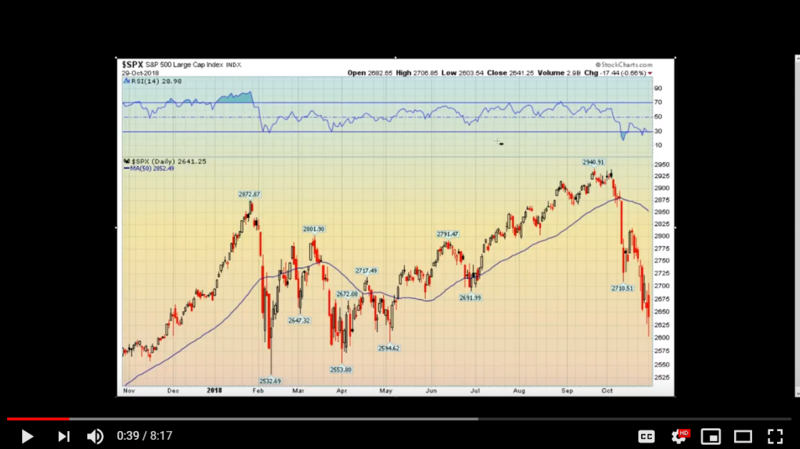 Let's start by looking at a chart of the S&P; 500. This is a daily chart, and every one of these bars represents one day. So you can see going into the beginning of 2018 it was really strong, stocks were roaring and then, WHAM when we hit our first correction of the year. The S&P was down over 10%. 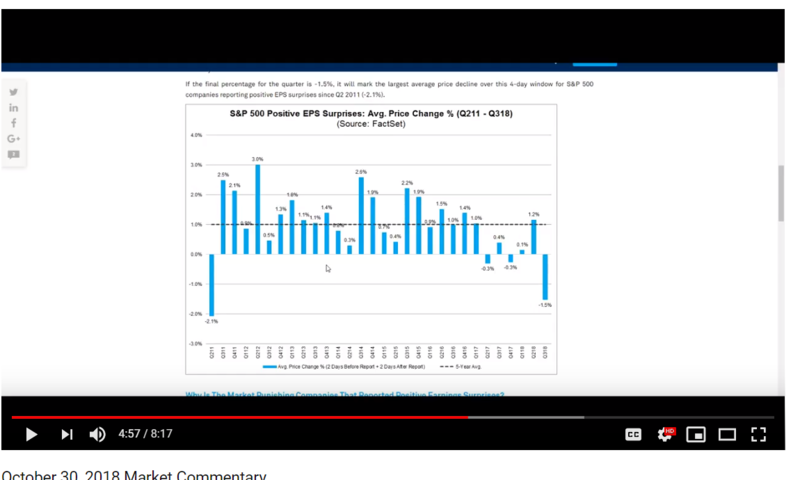 It had a retest a couple of months later which is very typical, and then we hit new highs again in September and WHAM second correction of the year S&P is down over 10% we've given up all the gains of the year again. So is this the beginning of something direr? The beginning of a recession a bear market? Or is this just normal fluctuation in the midst of a rising market? In my opinion, it's the latter. I hope I use that term correctly that it's in the midst of a rising market. Albeit, a rising aging market. Let me point to a couple of reasons why I think that. First of all let's get some perspective. Okay real quick let's look at this chart. 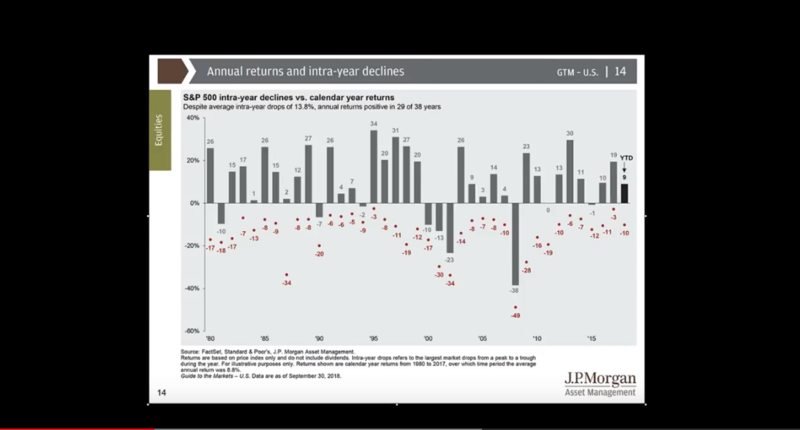 It's going back to 1980 and what it's showing us is calendar year returns with these gray bars and with these red dots these represent intra year declines. So you can see here that the intra year drop the average going back to 1980 is 13.8%. So on average at some point in the midst of a calendar year, the market drops at 13.8% on average, and it can happen more than once. But you can see that even if we have double-digit declines intra year, a lot of these years end up positive as a calendar year. If you remember 2011, we actually had a 19% decline intra year, and we ended up flat for the calendar year. Same thing happened in 2015 we were down 12% intra year we were pretty much flat for the calendar year. So 2017 was actually weird that was the weird year we were only down 3% intra year and the rest of the year was positive. Very strange. What we're experiencing right now not strange, actually it's much more typical. Let me show you something else that's really important. Earnings. The stock market is made up of companies and those companies; their prices are represented by what people think that they're worth. 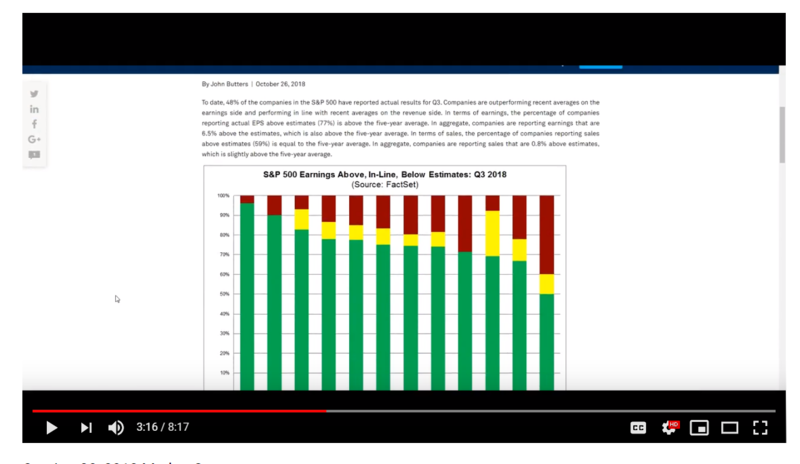 So earnings become incredibly important for the stock market how we're earning shaping up for the third quarter? Let's take a look. 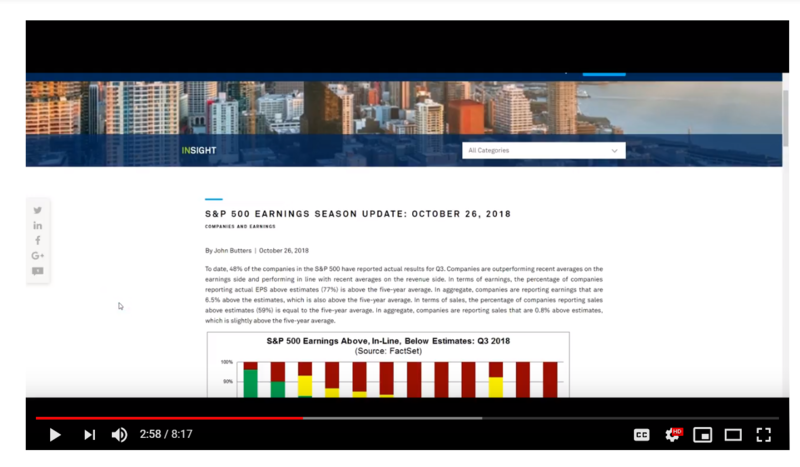 So far as of October 26th, 48% of companies had reported, and companies are outperforming recent averages on the earnings side. Ok, if we look down a little further here, this is a fact set report. 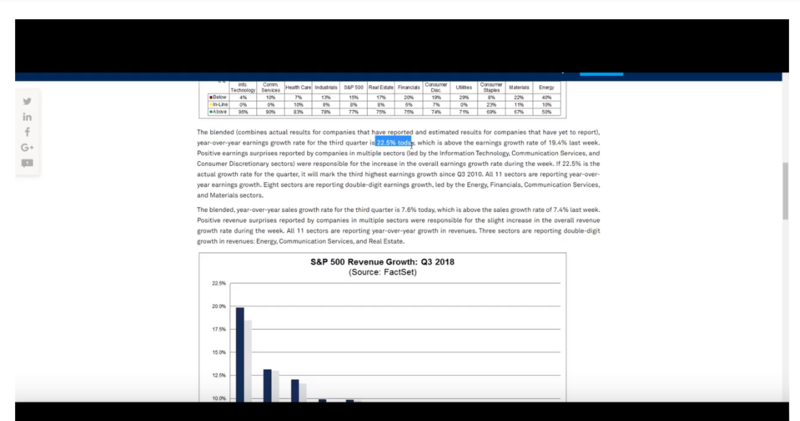 The earnings growth rate year-over-year for the third quarter is 22.5% which is above the earnings growth rate of 19.4% last year. 22.5 %. But what's really interesting is that even with these positive earnings surprises, stocks are getting punished. They're actually down, and this hasn't happened since the second quarter of 2011. In the second quarter of 2011 stocks had positive earnings surprises overall for the S&P 500, but the market went down. It was because we're having back then and now a disconnect between what's happening with companies and what's happening in the economy. People are scared of the what-ifs. What if interest rates go up too high? What if we get into a trade war with China? What if Brexit fails? What if? What if? What if? And it’s really important to pay attention to those what ifs. Don't get me wrong but we also can't live in the what-ifs, because if we did we would never ever invest in the stock market. So what happened back in 2011 when the what ifs worse waged? 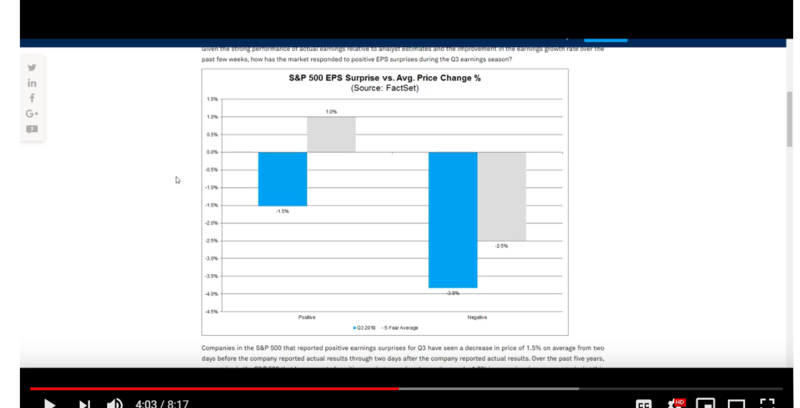 Well, you can see that in the following quarters everything acted how we would expect that the companies that gave positive earnings surprises were rewarded for those positive earnings surprises. So that's something that we would expect moving forward here as well because the stock market once it's able to put its focus back on corporate earnings then stocks should rise but while these what-ifs are in place it makes it really difficult for the stock market to go higher from here. Let's also look at GDP for the third quarter of 2018, GDP clocked in at 3.5% which is fantastic. 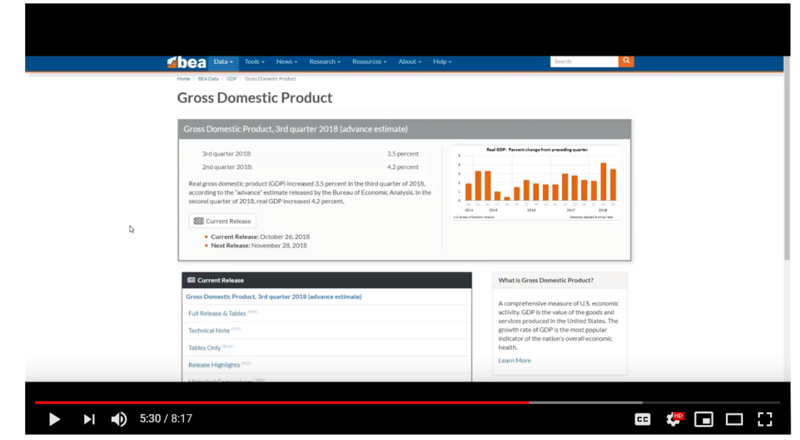 What a recession is, the official definition is GDP declining for two quarters in a row that means negative GDP growth for two quarters in a row. We're nowhere near that not only that, but we have accelerating earnings from companies that are reporting and positive surprises that are above average. Those two pieces of information do not point to a recession. downturn in the market without a recession. 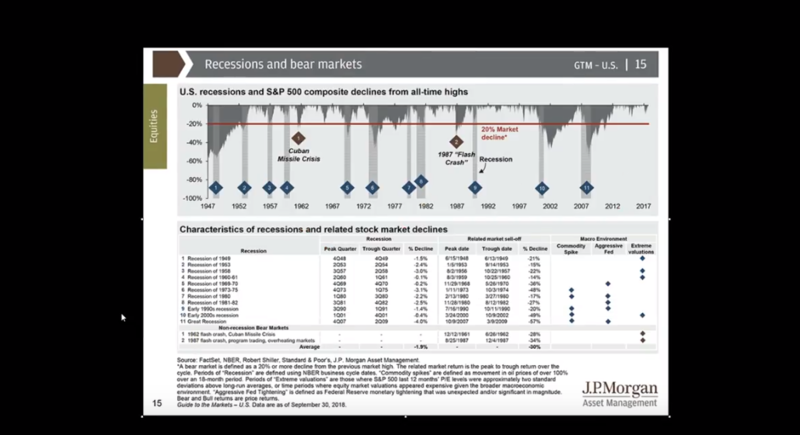 In fact, we've only had two bear markets since the Great Depression in which they happened without a recession. One was the Cuban Missile Crisis, and the other one was the flash crash in 1987. The Cuban Missile Crisis that downturn lasted six months. The flash crash that downturn lasted three months. 1987 as a calendar year was up 2%. If you are a hibernating bear and went to bed January first and woke up December 31st of 1987, you would have been up 2%. but if you lived through that and I was five, so that's my excuse for not paying attention that particular year. It was pandemonium; people thought the world was coming to an end. Here's the other thing to know though, if we don't see a recession on the horizon these sharp downturns that happen they are impossible to try to time or predict because they happen completely. You know, it's not something that you can anticipate. If you try to anticipate it, you end up cutting off your nose to spite your face. 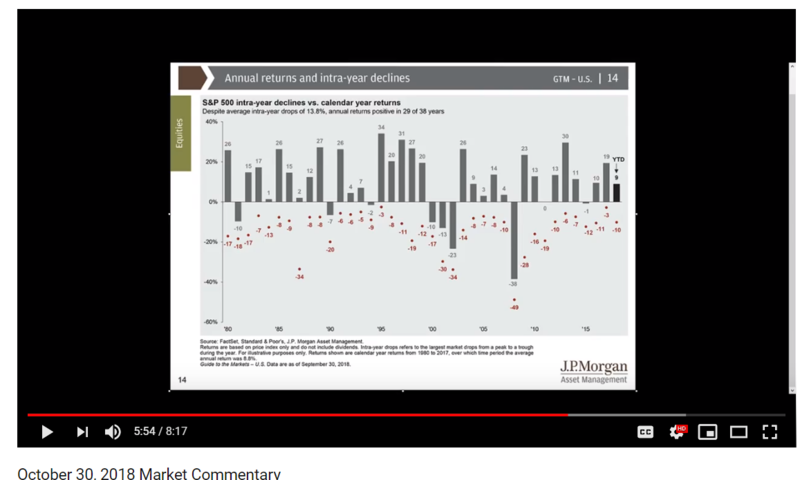 So the best thing you can do in these kinds of situations if we don't see recession is either ride through the correction because I doubt you're planning on spending a hundred percent of your retirement assets in the next six months. Or you can see this as an opportunity you could say wow I can invest like its December 2017. I'll take that deal but the worst thing you can do, in my opinion, is panic and make emotional decisions in which you may end up selling your assets at the bottom of the correction and then missing the recovery. If you're nervous about how your accounts are performing, it's a great time to call your financial advisor to ask if maybe you're not in the right risk tolerance. Because if you're getting a little bit too nervous, maybe your accounts are a little bit too aggressive or just to get some peace of mind and some assurances. That's why we're here. So rest assured we are paying attention. I look at several indicators every day. This is just a few a short snippet, but I hope this helps give a little bit of perspective. Registered Representative of and securities offered through Cetera Advisor Networks LLC, member FINRA/SIPC. Investment Advisory Services offered through Cetera Advisor Networks LLC and McDaniel Knutson Financial Partners. Cetera is under separate ownership from any other named entity. Exchange-traded funds are sold only by prospectus. Please consider the investment objectives, risks, charges and expenses carefully before investing. The prospectus contains this and other information about the investment company, can be obtained from your financial professional. Be sure to read the prospectus carefully before deciding whether to invest. Investors should consider the investment objectives, risks and charges and expenses of the funds carefully before investing. The prospectus contains this and other information about the funds. Contact Victoria Bogner at [email protected] or 785-841-4664 to obtain a prospectus, which should be read carefully before investing or sending money.